This week we will finish our discussion of the physical properties of gases (chapter 10) with a discussion on how real gases interact with each other and have molecular volume. You may be wondering, “why is that?” Why do molecules attract and repel each other, and what exactly gives the molecules volume? To answer these questions we need learn about electrons and molecular bonding. Over the next five weeks we will discuss how electrons form bonds in molecules and how different atoms are bonded together. To start off this discussion, we will lay the foundations by learning about the electronic structure of atoms. Reminder: Exam #2 is this Thursday! The exam will take place from 5pm to 7pm on the first floor of Keyes. There will be a review session held on Tuesday 10/23 (Mole Day!) starting at 8pm. More information can be found here. Homework #7 is due at midnight on Wednesday. Learning Objectives Relate the Kinetic Molecular Theory of Gases to diffusion and effusion. Quantitatively describe electromagnetic radiation. Relate the quantized nature of electrons to the interaction between matter and light. Qualitatively describe the electron orbitals and determine electronic configurations of the elements. Outside of Class MOLE DAY! This week we will explore the behavior ideal and real gases. We will jump ahead to chapter 10 this week and return to chapter 6 the following week. We aim to expand our repertoire problem solving techniques to be able to convert between volumes, pressures, and temperatures of gases to moles. We will also consider what assumptions go into the ideal gas law and when those assumptions break down. 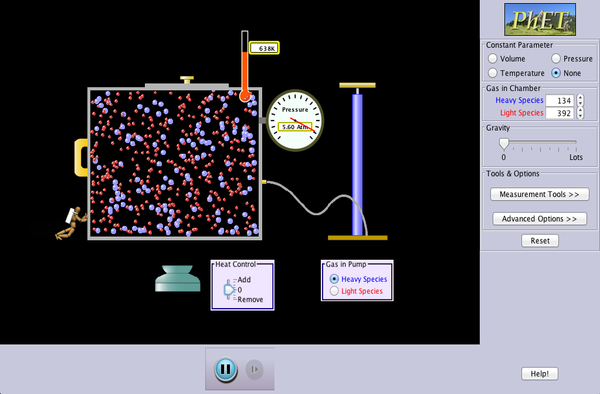 Be sure to check out the Gas Simulator! Homework #6 which covers the end of chapter 5 will be due Wednesday 10/17 at midnight. Remember, exam 2 is on the horizon! Exam 2 will take place on Thursday, 10/25, from 5pm to 7pm. Learning Objs. Quantitative problem solving using the ideal gas law and partial pressures Relate the kinetic molecular theory to the ideal gas law. Analyze why gases might deviate from ideal behavior.